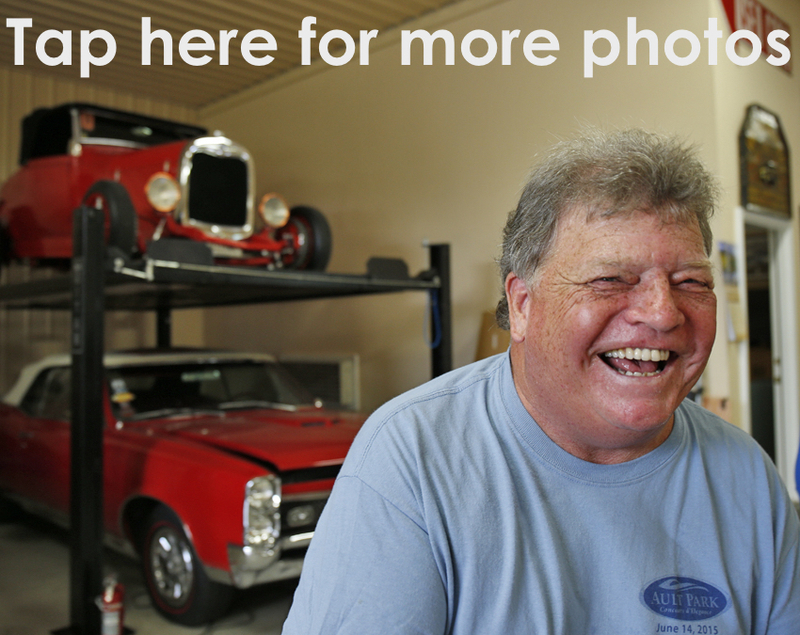 LIBERTY TOWNSHIP, Ohio -- A shared love for vintage cars shifts Rick “Opie” Willis and his wife, Sue, into overdrive every summer, but it is two charities that take the checkered flag. Sue spearheads the group that organizes the Ault Park Concours d’Elegance on June 12, which benefits juvenile arthritis. Opie — whose boyhood freckles and red hair earned him the name of Ron Howard’s “Andy Griffith Show” character — collects buckets of money for the Middletown chapter of the Wounded Warrior Project at a Fourth of July party and drive-in he hosts on their 26-acre Horsepower Farm. Both have been moved to give back, Sue said, by “heart-wrenching” encounters they have had with many victims of arthritis and war. Aside from using vintage cars for philanthropy, however, the couple’s two summer events couldn’t be any different. The 39th Concours takes place in a beautifully groomed city park nestled between two of Cincinnati’s most-desired neighborhoods: Hyde Park and Mount Lookout. It features 200 collectible cars like Ferraris and Mercedes-Benzes, an automotive art show, an upscale brunch and — new this year — a craft beer garden. Opie’s party centers around a couple of large garages and open country that used to be part of a dairy farm on the border of Middletown and Monroe Township. It features fried chicken and pulled pork, margaritas, American flag-waving parachutists, patriotic music by live bands, split the pot, a fireworks shows run by Opie (he is licensed by the Bureau of Alcohol, Tobacco, Firearms and Explosives to set them off) and a field full of as many as 80 muscle cars owned by his friends. The Concours gives out awards to car owners in about 50 categories. Opie gives out thanks to those car owners who drop a few bucks in his Wounded Warrior buckets. He charges $20 for every car that parks on his property and insists that people bring a covered dish. If they come empty-handed, he makes them turn around and go buy something before coming back. The Willises, both 59 this year and married nearly 28 years, come from different backgrounds. She grew up in Mount Healthy, attended McAuley High School and graduated from Edgecliff College with a degree in art. She had a successful career in retail and worked 13 years for General Electric. He went to school in Dayton, buying his first car, a 1964 Chevrolet Corvair, at age 16 for $50. He enlisted in the Army out of high school and served four years as a welder in Germany. Back home, he got into classic cars and went on to become a salesman for Phillips Medical Supplies . “I like cars, too, but I don’t claim to have any knowledge of them,” Sue said. The Willises’ now-common concern for charity began with Opie, according to Sue. He started volunteering as a beverage pourer at the Concours in the early 2000s and became chairman of the souvenirs committee. Opie eventually invited Sue to help out. “I asked him how I could get involved, and he said, ‘Consider yourself involved,’ ” said Sue, whose professional experience included planning events, managing operations and, generally, running a business. By 2008, she was directing the car show as the second executive director of the Cincinnati Concours d’Elegance Foundation, which took it over from the Arthritis Foundation in 2007. “There were all these things: soliciting sponsors, ad sales, managing people, preparing budgets, logistics, working with the city, state and police … It kind of felt natural, but it was still baptism by fire,” Sue said. Opie used to drive one of his muscle cars — he has 14 now, in addition to four daily drivers — down to a “cars and coffee” gathering at Fuel Coffee https://stopforfuel.wordpress.com/ in Columbia Tusculum. And, he said, he had given to the Wounded Warrior Project for years. The couple attended the Middletown WWP chapters special weekend of events in 2014 and decided to funnel their money directly to it. Opie then put his interests together and started hosting a cars, coffee and doughnuts gathering for charity on the first Saturday of the month. The Fourth of July party has been a tradition of the Willises for years. It grew to be a logistical burden when they held at their home in Liberty Township, however, so two years ago the couple moved it to their weekend getaway (there’s a three-bedroom house attached to one of the garages). “Over here,” Opie said, gesturing to the open field behind his compound, “I own all this land. It’s 26 acres. We can do whatever we want, and nobody messes with us. It works out real good. He said his events have raised $40,000 over the past two years and $4,000 already this year. He will add to that the $10,000 or more he expects to collect on the Fourth of July and present it at the Warrior Weekend to Remember that continues until June 12 in Middletown. He said the feedback he gets from veterans who benefit from all that he does can be overwhelming.